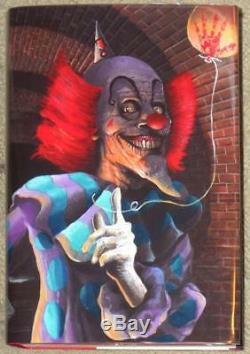 IT by STEPHEN KING LIMITED EDITION DUSTJACKET SIGNED by ARTIST FIRST EDITION Sixth Impression. Now a major motion picture Stephen Kings terrifying, classic #1 New York Times bestseller, a landmark in American literature (Chicago Sun-Times) is a thriller about seven adults who return to their hometown to confront a nightmare they had first stumbled on as teenagersan evil without a name: It. Its a small city, a place as hauntingly familiar as your own hometown. Only in Derry the haunting is real. They were seven teenagers when they first stumbled upon the horror. Now they are grown-up men and women who have gone out into the big world to gain success and happiness. But the promise they made twenty-eight years ago calls them reunite in the same place where, as teenagers, they battled an evil creature that preyed on the citys children. Now, children are being murdered again and their repressed memories of that terrifying summer return as they prepare to once again battle the monster lurking in Derrys sewers. Stephen Kings most mature work St. Petersburg Times, It, will overwhelm you to be read in a well-lit room only (Los Angeles Times). Readers of Stephen King know that Derry, Maine, is a place with a deep, dark hold on the author. It reappears in many of his books, including Bag of Bones, Hearts in Atlantis, and 11/22/63. But it all starts with It. This is a limited edition dustjacket that is signed by the artist, Glenn Chadbourne and is #389 of 500 (an example of my personal copy is shown below left). It also comes with the original dustjacket, both placed in a Brodart. If you don't I can't go back and fix it later! For any of the other hundreds of items I have available use the link at the bottom of the page. About Me & This Item.. I promise everything there is to know about this item is in this description. I also do not subscribe to "grading" as frankly, grading is totally inconsistent and most of the "graders" TRULY have no clue, so I will use plain English if it is OK with you..
A brand new hardcover book in EXCELLENT condition, with original priced and unclipped dustjacket as issued and is quarter-bound in red cloth with red cover boards and white embellishments on the spine. This book measures approximately 9.2 x 6.1 x 2.2 inches and is a VERY nice copy. I have placed it in a Brodart protector for safe keeping. There are links above and below and why not bookmark my site to make it easier to find at a later date! Instead, select ADD TO CART. I accept Credit Cards, eChecks and electronic transfers with. Unfortunately, direct bank transfers are not offered due to cost and security concerns. As I reside in the USA, all payments must be made in US Dollars & Cents. PLEASE remember this when you leave feedback scores as the choice is yours and not my fault if it takes a long time to get there! International deliveries usually arrive within 1-2 weeks but CAN take up to a month! Finally, we do not mark merchandise values below value or mark items as "gifts"; it is illegal and immoral. Ask and I'll try to answer.. Please check out the other "lovely" items I have just waiting for you by. The item "STEPHEN KING IT A NOVEL FIRST ED LIMITED ED SIGNED DUSTJACKET NEW HC" is in sale since Tuesday, December 11, 2018. This item is in the category "Books\Fiction & Literature". The seller is "alan-53" and is located in Walnut, California.